Rob, London: I keep buying what I think are decent shoes (Barker brogues x2 and Loake Oxfords x1) with leather soles. I’ve found they soak up water when I wear them on a wet day. It is coming through the soles! Are my shoes not a good enough quality, or what? Let me tell you a story, Rob. Back in the dark ages, shoes came in two exciting varieties: wood and skin. A man placed either a piece of wood or a piece of animal skin on the sole of his foot, and then bound it on with twine. Both were hard-wearing, but in the end skin won out over wood. It could be just as tough if doubled or tripled up and, most importantly, it breathed. Because it was the living skin of a horse, cow or other readily available animal, it both protected the foot and let moisture escape. Skin never looked back, and leather is still used today for all parts of high-quality shoes because of this breathability (as well as other convenient characteristics, such as flexibility and the ability to be treated and dyed). So no leather-soled shoe is waterproof. It lets air out and it will let some water in. 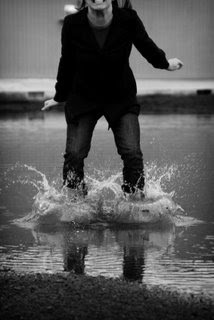 It shouldn’t soak your feet when you step in a puddle, but it will let in water if left in that puddle for too long. Or if you step through enough different puddles on the way to work. To avoid this, some people wear rubber overshoes on top of their brogues. This is rather extreme. Most just try to avoid stepping in puddles. If their shoes do get wet, they look after them, stuffing them with paper when they get home and inserting shoe trees to stop them losing their shape. There are various other strategies you can adopt to minimise wetness. One is to go for English shoes, with Goodyear welting, rather than Italian, which will likely have a Blake construction. A Goodyear welt produces a thicker sole with a visible rim around the foot; this keeps the upper away from the water and means less gets in. But it sounds like you already buy English shoes. A second alternative is to go for double or triple-soled shoes. These literally have one or two more soles on them, making for a thicker bottom that keeps you even further away from the wet. But these can look clompy and aren’t really suited to business. As a third alternative, you could replace your leather soles with rubber ones. You will lose the breathability of the sole, but no water will get through. Rubber soles can be rather ugly, but there are some very elegant types made that do not look very different from leather, at least at first glance. This is probably your best option. Do check when you go to the cobbler’s though that your leather soles are not just wearing through. They thinner they are, the more seepage there will be. It might be best to try replacing them before resorting to rubber. You can follow the discussion on Reader question: Wet shoes by entering your email address in the box below. You will then receive an email every time a new comment is added. These will also contain a link to a page where you can stop the alerts, and remove all of your related data from the site. How can I submit a reader question Simon? Just ask one in the comment field of another blog, Michael. Feel free to ask one here and I will do my best to answer it. AP, I haven’t had rubber soles replaced myself, but I understand it can be done. What’s the best way to dry it if this happens? It’s not recommit to wear braces with jeans correct? Do braces come with” claw “closure like suspenders?